Thomas Balsley Associates, in collaboration with SOM Architects, win Merit award for their design proposal for the Nanming Riverfront Culture Central Business District in Guiyang, China; bold and multi-layered approach with a distinct focus on cultural relevance, sustainable growth, conservation, and resiliency. Awards will be presented at the ASLA-NY Design Awards Ceremony and Reception to be held on Thursday, April 7th, at the Center for Architecture in Manhattan. Guiyang is a vibrant metropolis poised to play a significant role in the rapid development of inland China. Based on renewal of its historic urban core the Nanming Cultural CBD open spaces will provide a network of public spaces; both urban and natural settings. A comprehensive landscape strategy – provision of district-level renewable energy, water reduction, high performance landscapes, and transportation networks designed to reduce carbon impact by up to 40 percent – will become the primary driver of city form with more than 54 hectares of new parks. These linked systems will connect neighborhoods, foster vibrant communities, and provide a continuous and diversified riverfront experience. Sustainability will be addressed at every scale of development; street and building level to the broader. The proposed plan will also leverage the inherent geography and topographic conditions to collect and treat rainwater runoff, utilizing bio-filtration and infiltration strategies. An urban conservation project, the TBA/SOM proposal aims to improve existing infrastructure and quality of living conditions, provide more public areas and parks, and increase access to resources. 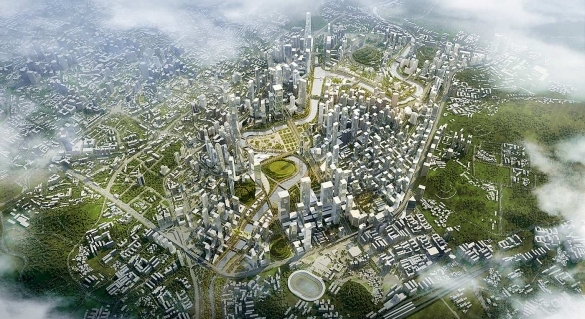 Away from industrial remains, the new CBD will be home to a new generation of Guiyang residents – offering a healthy lifestyle to attract young professionals and innovators – and a model for Western Chinese cities to follow in developing China’s vast inland areas, in a manner that is both culturally and environmentally responsible.